It was all down to Ronnie Scott, really. As founder and owner of the legendary jazz club, Ronnie had always kept his doors open for a wide variety of music, including the more adventurous types of jazz, blues and rock. As long ago as 1969 I had had dealings with him when he agreed to put on a concert by the oddly-named Igginbottom, a band whose first album I had co-produced. Hailing from Bradford, Yorkshire, this gifted young jazz-rock quartet happened to feature a guitarist who would in an amazingly short time become a world-acknowledged master of fusion music – Allan Holdsworth. 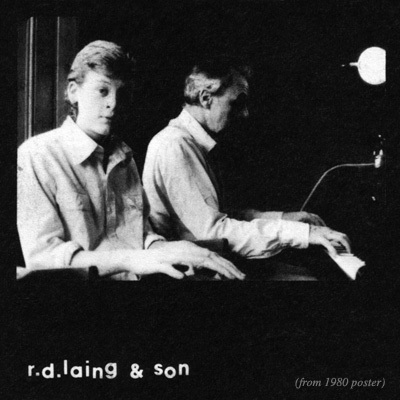 So it came as no surprise to read in the club calendar one day in 1979 that a soon-to-be-featured artist was the renowned anti-psychiatrist RD Laing, reading his poems (which had already been published in the book “Knots” and “Do You Love Me?”) over a bossa nova guitar and percussion accompaniment. Having already read his poems and also his books “The Divided Self” and “Sanity, Madness and the Family” I was inspired by his work, and excited by the possibility of being able to meet him and invite him to participate in Miniatures. On the evening in question, I boarded the tube to Soho with great anticipation. 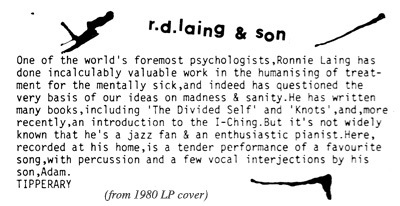 Luckily, I arrived early and was able to have a word with Ronnie (not the club boss; Ronnie was what RD was called by his friends) before the show, and gave him a quick verbal description of the concept of the album, including mention of several artists that he might know – Steadman, Coxhill, Nyman, etc. I felt a warm hand on my shoulder a few minutes after the performance was over. I turned to see a smiling Ronnie (RD, that is) saying “I’ll gae it a whirl.” Delighted, I got his address and set up a date to go and record him at his home in Hampstead, North London. The house was a large, impressive, all-white building with a spacious lounge boasting a grand piano. I had no idea what Ronnie was planning to do, but expected him to read one of his poems. “I think I’ll play a wee bit o’piano,” he said genially, so I set up my microphone close to the instrument and sat by my tape recorder waiting for him to start. He doodled a few chords and arpeggios and I could immediately sense that he was very comfortable with the instrument, perhaps not a real pro but certainly an accomplished amateur. His playing had a sort of casual drawl to it very like the way he spoke – both giving one the impression that he was slightly, contentedly, drunk. Once he got into the swing of it, and had settled on the World War I classic “It’s a Long Way to Tipperary” as the tune he would play, his son Adam, 12 years old at the time, came and sat next to his dad, playing a small bongo such as one would buy at a souvenir shop on the continent, and singing the odd phrase from the song in a light, shy voice. I sensed a camaraderie between father and son that touched me, particularly as I hadn’t had a dad since my parents divorced in 1966. Whether I was mistaken or not, (judging by later reports of the Laing family life, and a marital separation little over a year after my visit), it felt like a good day in the Laing household. His warm and welcoming wife Jutta had already made a nice cuppa tea for me, which certainly eased my slight tension at being in the house of such a legendary figure (one who I had no doubt could see right through my confident façade into the heart of my deepest neuroses, gulp!). After the recording was done, a matter of maybe 15 minutes or so, I started packing up my gear and Ronnie said, with noticeable relish in his voice, “Ah, six o’clock, time for a wee drink. What’ll ye have?” I was interested that someone would want to regulate their drinking to a certain time of day like that, and wondered if it was a method by which to avoid the temptation of drinking at all hours of the day, perhaps a problem he’d had to deal with himself. We agreed that red wine would be nice, and a bottle was duly brought out and he took me into the next room, a kind of den with a large stereo system and a thick red carpet. As he poured the wine, Ronnie told me that he was very proud and honoured at having just been asked to write an introduction to a new edition of the I-Ching. Apparently he wrote several drafts, but I don’t know if it was ever published. Brazilian music seemed to be a passion with Ronnie, as he pulled out one LP after another of same, quaffing wine at a fair rate of knots while I sipped. The music was indeed tremendously emotional and lyrical, and as the evening progressed it obviously got to Ronnie more and more. Finally he was curled up on the carpet in a foetal position, his face in a rictus of euphoria, saying” It’s fantaaastic, can ye not FEEL it? … incredible… from the heart… from the soul… BRILLIANT…!” By this time I felt he’d lost me; perhaps to keep up I should have downed far more wine, like I used to in my young days (ha! here I was aged 29 and my hard-drinking days were already over, while this man of 51 was still thrashing it). So the kind of heart-to-heart chat I had secretly been hoping for didn’t materialise, and I decided to bid my extraordinary host goodnight and head off home to edit the tape. The next and last time I saw Ronnie was at the Miniatures launch party, which he kindly agreed to attend. Perhaps unfortunately for him, it was an afternoon tea party with nothing else to drink, and few people that he knew, which may explain why he left early. I can still see him walking energetically down a sunny street in North London with a Miniatures LP tucked under his arm. A fine and fond last memory of this remarkable man, who was daring, generous, kind – and flawed, as all we humans are. It was only ten years later that I read with some sadness that Ronnie had suddenly had a heart attack and died while playing tennis. About twenty years after that, when I was trying to track down his next of kin to let them know of the re-issue of Miniatures, I encountered more sad news – his son Adam had recently died alone, his body found in a tent in a bleak corner of the Balearic island of Formentera, surrounded by empty vodka and wine bottles. This article is a fine tribute to Adam and also contains lengthy commentary re his father’s life and family. Well worth a read. Next up: Fancy a double? On the beach?